Today marks an important milestone for Wealthica, and in my opinion one of those “game changing moments” in the Canadian Open banking revolution. Wealthica is opening its platform to third-party developers, allowing anyone to make use of the data they have in Wealthica. We are also releasing the Google Sheets Export feature allowing our users to automatically export positions and transactions to Google Sheets. When we started Wealthica, my partners and I envisioned Wealthica as a financial “hub”. We wanted to build a platform that would allow investors to aggregate all their financial data, but most importantly to leverage that data to power other financial apps or to share with people they trust. 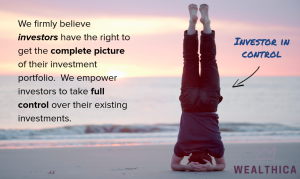 Our mission at Wealthica is to empower investors to take control of their investments. Our mission at Wealthica is to empower investors to take control of their investments. The first step toward that goal was to build the aggregation engines that would automatically connect to Canadian financial institutions. I think its fair to say we’ve achieved a large part of that goal now, with Wealthica being the largest financial aggregator in Canada with support for close to 50 financial institutions and investment portals. We’re still missing support for regular banking, the #1 feature request we get from our users, and are looking at adding it in the next months. Today, we’re going further and releasing our add-ons feature, allowing anyone to write “apps” that plug in and leverage the financial data stored in Wealthica. The add-ons feature allows anyone to write “apps” that plug in and leverage the financial data stored in Wealthica. 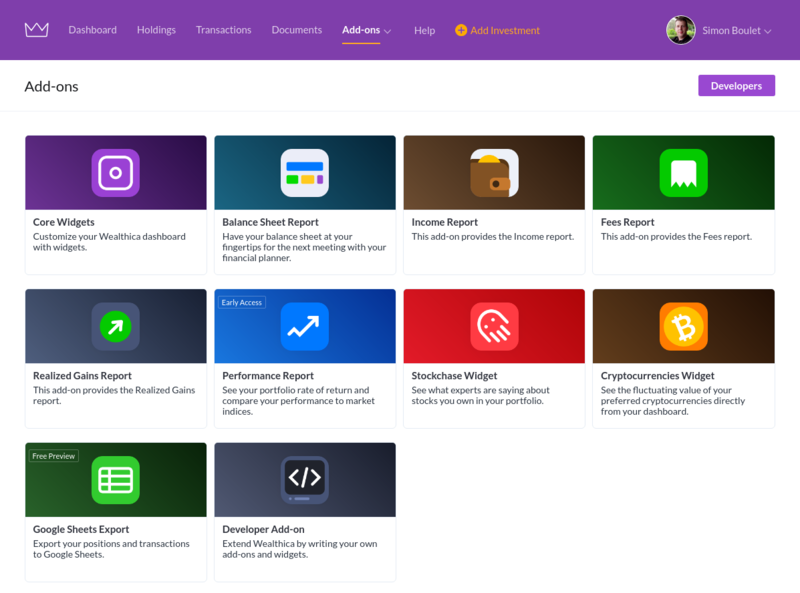 In the last months, our team has been busy building a framework that would allow to “plug in” external add-ons to Wealthica and we migrated our own reports to that new platform. This framework leverages modern web browser technology to isolate add-ons and to grant them fine-grained access to your Wealthica account. The add-ons also mark Wealthica first step in offering paid advanced features. We are releasing the Google Sheets Export add-on (Free until September 2018). With this new feature it’s now possible to export transactions and positions from Wealthica to Google Sheets. Users can now automatically consolidate their daily financial transactions to Google Sheets, or enhance their existing sheets with automatic transaction and positions data from Wealthica. Export transactions and positions from Wealthica to Google Sheets. I’m extremely proud of our team for bringing these new features, and very excited with the new opportunities the add-ons bring to our users! If you are a developer and interested in developing your own add-ons for Wealthica, we’ve published a library and a sample add-on on GitHub, and and are open sourcing some of our own add-ons. Simon is CEO & Cofounder of Wealthica (consolidating and tracking all your investments in one place). He is both a master of business and code. Fortunately, he still favors code.